I support the right to publish offensive things without limitation, qualification or exception. Defense of the right to satire unmolested by violence and coercion must be absolute, unequivocal and unqualified. There can be no “but” because one man’s outrage is another man’s art. The image to the right may, at first glance, be seen as an insult to the religions whose figures are depicted. Upon second glance, we might see in context that the image pays compliment to those religions, while the insult is instead to the one whose Prophet was omitted. Vulgarity in satire becomes provocative think piece. 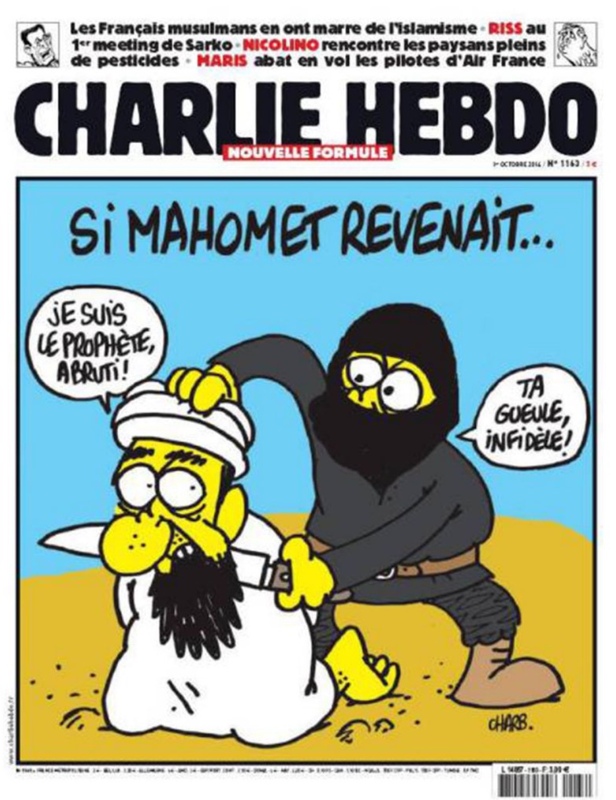 The same Charlie Hebdo images deemed racist by some are interpreted as mocking racism by others. There is no right or wrong answer. Subjectivity is inescapable; offensiveness being in the eye of the beholder, the only way to avoid it is not to speak at all. 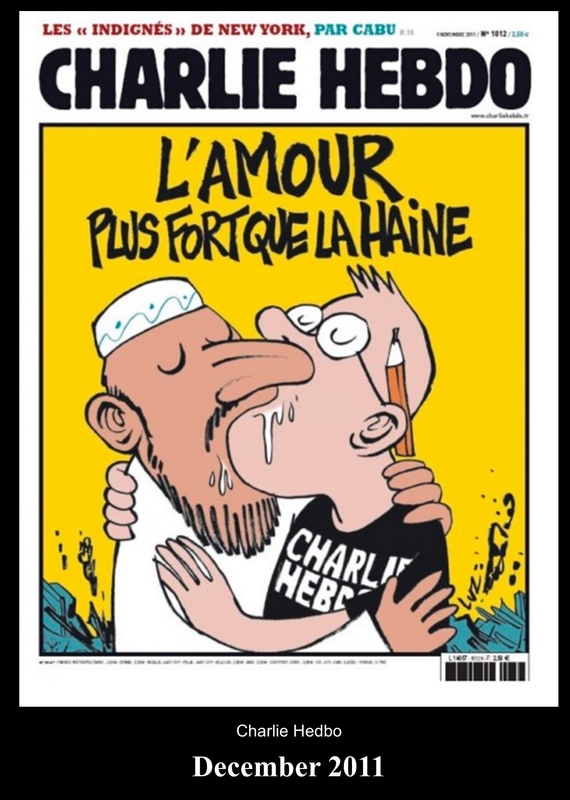 I find some of Charlie Hebdo’s images grotesque and unpalatable, others almost touchingly sweet. I interpret the one on the left as a defense of Islam against those who would distort it with their violence, and the one below as a heartfelt insistence that our common humanity will prevail over all differences. Others will look through the lens of their own perspective, find different meaning in the same images, and take offense or not accordingly. There can be no “but” because freedom has no meaning if we censor ourselves based on the dictates of any conscience but our own. Freedom left politely unused cannot be shown to exist, and courtesy and restraint become the foundation on which we build our own cages. The battle between those who would be free and those who would be reverent is not between different races and religions, between east and west, or between nation-states. It is a battle between those who love freedom, in all its messy, imperfect glory, and those who would spill blood in pursuit of their own personal utopia. We must never fail to love our liberty more than they hate it. Those who qualify their defense of freedom with any “but”—but we ought not mock religion; but we ought mind our own prejudices and hypocrisies; but we ought not be surprised when the profane elicits violence—are trying to straddle a fence that cannot sustain the mighty weight of such freedom. There can be no “but,” because the stakes are too high. A war not fought with words and ideas, however cutting, will be fought instead with drones and bombs. Rewarding the murder of satirists with suppression of images, rather than publication of a thousand more, foregoes the peaceful power of the Streisand Effect in favor of enhanced interrogation. Those who would be free, of every race, religion or nationality, must form a circle of defense around the indefensible. We must give rein to that rebellious voice inside that whispers, If you tell me I must not do something, I will do it to prove I can. We must value freedom over respect, not just when it is tasteful and without cost, but always. It is where we stand in the hard cases that defines us. Hear, hear! I don’t normally post politics on FB but the “I support free speech BUT…” chorus last week pissed me off so much that I made an exception.